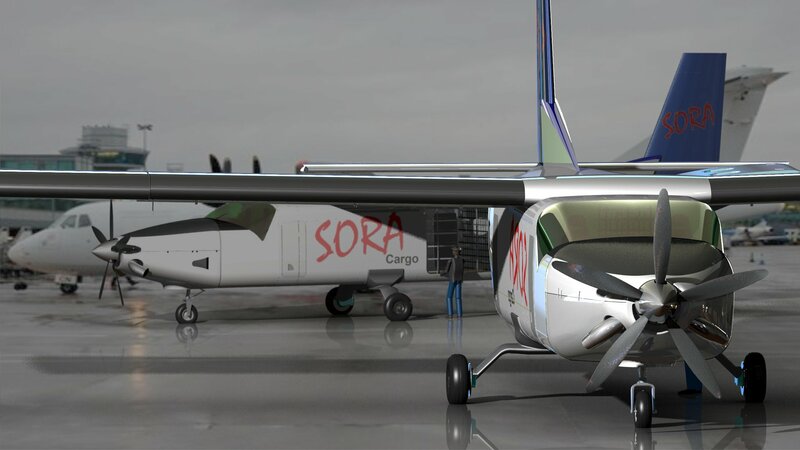 A visual representation of the Sora Aircraft at a Regional Cargo Hub. Sora Aircraft is under development. Designed for freight and utility operations, the aircraft is un-pressurised with fixed undercarriage, features which lower the operating costs and improve reliability. Its primary target is the worldwide air cargo feeder market, with additional applications in passenger operations and executive transport. 5300 lbs (2400 kg) payload. 863 cu ft (24.4 cu m)cabin accommodates bulk, palletised or container loads. Large cargo door on left hand side. Manufactured using proven techniques; designed and built by experienced staff. Constructed with an aluminium primary structure and composite secondary components (engine cowling and tail section). Maximum takeoff weight of 12,500 lbs (5670 kg), meets FAR Part 23. Please read our blog to see updates of progress to date on Sora.